I sat on one of thirty or so hard gray plastic stools at the back of the temple meant to catch the overflow of the faithful. I knew the minute I stood on the outside of the door to this sanctuary that I would join them, though no westerner appeared to be among the worshipping. I still do not know where this bravery is coming from. I keep wondering if it has something to do with all the times when I was little and chickened out when dared to do something…like I am making up for all those dares now. Brian McElroy, if you are reading this, I would totally swing on that rope swing over that mean old man’s backyard ditch if you dared me today. No way would I let you tease me about chickening out for an entire two years that followed that little incident. But this does not feel like something I am daring myself to do. Not like the zip lining in Belize. Not like the drive to get on the White House Staff during the Economic Summit when it came to Houston. Not like buying a bus ticket in Singapore to go into Kuala Lumpur all by myself. I felt pulled into this place. 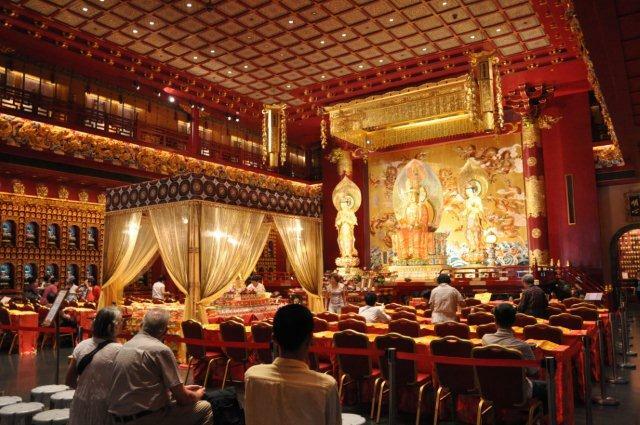 This place on Waterloo street, in Singapore that houses the holy relic of one of Buddha’s teeth. This place is considered one of the holiest places in the world, let alone Singapore. Tourists pace around the courtyard, not daring to go in, but wanting to take pictures of getting close to it…of the colorful and ornate interior that is easy enough to capture without actually entering. They will let you take pictures anywhere in here, but I store my camera as I light a joss stick, pray for peace and place it reverently in the sand outside the temple door…I know how to do this now. Inside there is a sign indicating that it is proper, but certainly not required, to make an offering of a candle and/or flowers to the Buddha. I make my way to the stand at the side where a gentle lady takes my money and hands me a candle wrapped in flowers…assuming I know what to do with it. I do actually, but only because I just saw someone else make her offering before taking her seat amongst the faithful. This building has five stories, the top four house museums, a gift shop, gardens, a tea shop and the golden protected sanctuary where the sacred relic is kept. But for now, the chanting draws me to the wildly ornate inner chamber…to the chanting of the monks. Pulling out the arrow of desire…patience putting an end to attachment…my western mind struggles with these concepts, even though I feel the truth of it in my heart. But I don’t know any of this message as I sit in the middle of people who, like me, are sitting on small gray overflow stools. But who, unlike me, are following along in their own book of the Sutra (at least that I what I am guessing they were as it was all in Chinese characters) and sing-songing along with the orange robed monks who floated through the room at intervals delivering critical components to the service that I did not understand, as they chanted. I bowed when everyone else did. I turned to face another direction when everyone else did. But mostly, I closed my eyes and let the sounds of the hour and a half service pour over me and then through me. My heart understood something my mind could not. And after twenty minutes or so, my mind rested and stopped trying to figure out if I was in the right place. I stopped worrying that I did not really belong there. I stopped wondering if the people there judged me for intruding on their sacred service. I know so little about Buddha, but what I felt in there was acceptance. I was creating my own separation, my own doubt, my own judgment. And I stopped. And when I did, I could hear the chanting differently. What had frankly always felt sleep inducing and a little like droning to me, suddenly held passion and fire. What had felt cold and emotionless, now had life, warmth, intensity. How had I missed this? How is it possible that I had shut myself off from the experience of this with my own restrictive perspective? The entire temple was stunning. In total, I spent more than three hours there, yet it felt like almost no time had passed. I walked through the gardens. I explored the museum. I turned the prayer wheel and I meditated before the Buddha’s tooth. But nothing could touch the experience of just being part of a flow I have been a part of that evening. Once again, my experience of a temple in Singapore defies my expectations and opens space in me that I didn’t know was there. Taken long after the service ended, as I was leaving. This entry was posted in change, flexibility, travel, work by kimcambron. Bookmark the permalink.